We recently adopted a 9 yr old male german shepherd. He was crated all his life and was never neutered. He destroys everything and he won't listen when we try to tell him no. He gets into the trash, he gets into the laundry, he eats soap, he shreds anything that can be shredded, even soup cans. He goes potty in the house and follows after us and won't leave our sides. He whines if we close the door to keep him out of the bedroom. 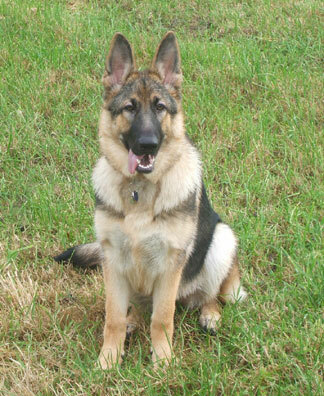 We have a 3 yr old female shepherd which we had before we got Jake. How do we train him to listen and behave? They both need it but he's the worst. Wow. You really need help. He is abusing your good nature it sounds like and you need a good trainer...it shouldn't take but a very few lessons for both the dog and mainly you to know how to handle him. Or, invest in the Cesar Milan series on DVD or his first book. It is great! He covers everything you need to know to rehab this gorgeous dog. He is really beautiful! Poor fella. (And you guys too) This boy needs training, which he obviously never got, socialization, which he obviously never got, and plenty of patience from you and your family. Just think of it this way, developmentally you have a 9yr old puppy on your hands. He needs to be housetrained, socialized and trained to be a good family member. And it sounds like your other GSD needs some help too. Get your dog signed up for dog training classes - it'll be the best money you ever spent and the best help you can get in learning how your boy thinks versus what you want he to do. Training, training, training is the answer.